Press play if you like: Melodic psych-rock; drone with a good backbeat; the idea of a younger, more rocking Deerhunter. 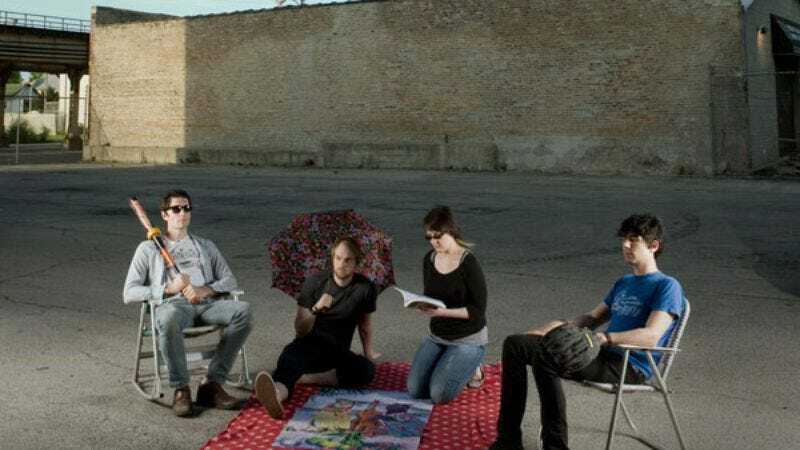 Some background: Chicago’s Radar Eyes first emerged (to a degree anyway) in 2010 with a limited-edition cassette release, which in retrospect sounds like a rough sketch for the pop-friendly psychedelia of the band’s self-titled debut on local garage-punk label HoZac. While the cassette sounds like a group that’s destined to slug it out at basement shows and dirty rock clubs for stoned drunks, Radar Eyes finds Radar Eyes expanding their sound to new levels of grandeur. Not that Radar Eyes get overly grandiose on the LP: Songs like “I Am” and “In Love” are propulsive, hooky rockers displaying an infectious energy that’s lacking in the spacey, trance-like psych of groups like the Black Angels. This music isn’t normally associated with dancing, but Radar Eyes is zippy and bouncy enough to get the body moving. And it won’t end once the music stops: Radar Eyes is a seriously catchy record. Try this: The catchiest song on Radar Eyes (and one of the catchiest we’ve heard all year) is the Deerhunter-like “Miracle,” which moves on a fat bassline and endlessly chiming guitar that refuses to leave our heads.